Fly Fishing South Africa: book publishers - how to: fly-fishing tackle, fly fishing rods, fly reels, fly fishing Gear, how and where to flyfish in South Africa. For the tastiest fly fishing, just add salt! Saltwater fly fishing is the ultimate fishing challenge. This book will more than prepare you to meet it. 'If you�re about to start fly fishing in salt water, there's no better place to start than this little book.' � Dean Riphagen, guide, outfitter and expert flyfisherman. 'The learning curve begins with Curtis & Boulton�s South African Saltwater Fly Fishing Clinic. Buy it!.' - Mark Yelland, guide, fly fishing guru and member of the SA National fly fishing team. 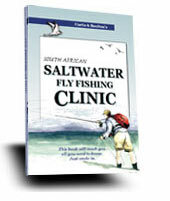 Paul Curtis is author, co-author and publisher of several of South Africa�s best selling fly fishing books, including the Clinic series. Jonathan Boulton is a well-known southern African and international fly fishing instructor and guide. With his wife Sarah, he owns and runs Mavungana Fly Fishing. Anthony Kr�ger is field editor of one of South Africa�s top fly fishing magazines and an acknowledged saltwater fly fishing expert. His great love is estuary fly fishing. Sudesh Pursad is a member of the South African President�s fly fishing team. Nobody knows rock and surf fly fishing better. 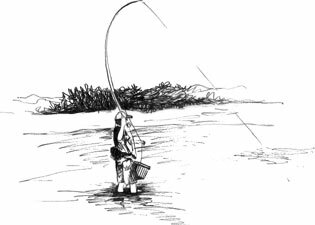 Choose from the Introduction, or 2 below for a small taste of what you�ll get from Curtis & Boulton�s Saltwater Fly Fishing Clinic.